UPPSC Lecturers Jobs Recruitment Exam-2018: Uttar Pradesh Public Service Commission released online recruitment notification to recruit the Lecturers Jobs in UP Higher Education Department and Shiksha Vibhag of Uttar Pradesh State. For UP Higher Education Lecturer posts candidates should have cleared NET/SET/SLET. For Shiksha Vibhag Lecturer Jobs candidates should have completed PG. Total 718 Lecture Jobs vacancies available in 29 subjects of UPPSC recruitment 2018. UPPSC filling this lecturer jobs in Government Degree Colleges of Uttar Pradesh State. Selection fir UPPSC Lecturer Recruitment will be through Screening Test and Interview. Last date for application form online submission for this UPPSC Govt Degree Colleges Lecture Jobs is 21-11-2017. For more details regarding Uttar Pradesh PSC Lecturers Jobs of Shiksha Vibhag and Govt Degree Colleges educational qualifications, selection process, age limits, how to apply online and more information is given below. 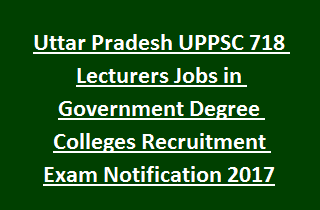 Download notification here for UPPSC Lecturers Jobs in Govt Degree Colleges, Subordinate Services. There are total 718 Lecture vacancies available in this current recruitment of UPPSC Government Degree Colleges and Shiksha Vibhag (Education Department of UP) Lecturers posts. For both the posts candidates age limits are 21-40 Years and age limits are applicable for reseved candidates as per UPPSC Norms. For Lecturer Jobs in UP Higher Education Department Candidate must have qualified Post Graduation with at least 55% of marks and Should have qualified SET/SLET/NET in relevant subject and NET qualification is required. OR Phd qualified candidates are eligible to apply. For Lecturers in Shiksha Vibhag UP candidate must have qualified Post Graduate in relevant subject. For SC/ST candidates Processing fee is Rs.25 and Exam Fee is Rs.50/-. Last date for fee payment is 13-04-2017. The selection for Lecture Jobs through direct recruitment shall be made by the Commission on the basis of Interview, However the Commission will hold a Screening Test to shortlist the candidates for Interview. A separate press notification will be issued for Screening Test regarding programme and syllabus etc. Download Exam Pattern and Syllabus for UPPSC Govt Colleges Lecturer Jobs PDF format. Application form will be accepted online from 24-10-2017 and closing date is 21-11-2017. Submit application form @www.uppsc.up.nic.in. Candidates who are having required educational qualifications those candidates only apply for this lecturer posts of Govt Degree College of UP Higher Education Department and Shiksha Vibhag of Uttar Pradesh. It is mandatory to mention latest email id, mobile number. Upload Image and signature in specific sizes. When the exam will be held?